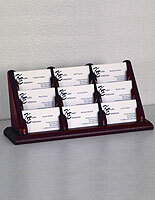 Looking for a more traditional display for your contact & visiting cards? 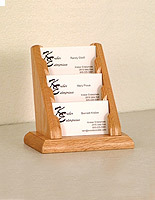 A wooden business card holder provides a warm, almost vintage appeal that is great for upscale office environments. 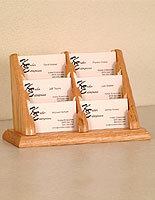 Waiting rooms at corporations, law firms, and clinics are some of the most popular places our customers have set up these wood business card holders. 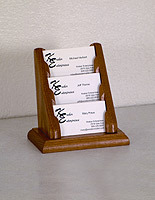 The desktop stands come in several different finishes, from light & medium oak to darker mahogany. 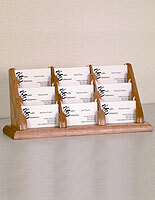 The natural look of the wood has been described as "comforting", so it is no surprise that so many offices use hardwood holders. 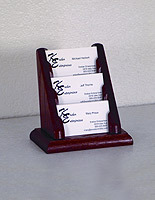 Our collection includes a variety of pocket configurations. This way, users can show just a handful of different calling cards or a large assortment. 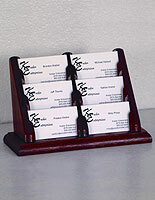 BusinessCardHolders2Go has got you covered in either case. 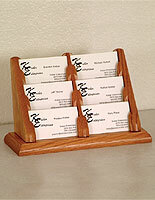 Choose the number of pockets and wood finish to start advertising your company information the traditional way!